A point at known location x1, y1, z1. There is a second point, which is connected with the first point by a line with length of bounding box l/2. The line is rotated in 3D around the main frame axes with rot_x, rot_y, rot_z. How to get the x,y,z coordinates of the second point? To be more precise: The main frame origin is at 0,0,0 and a bounding box of an object at known location x1, y1, z1. 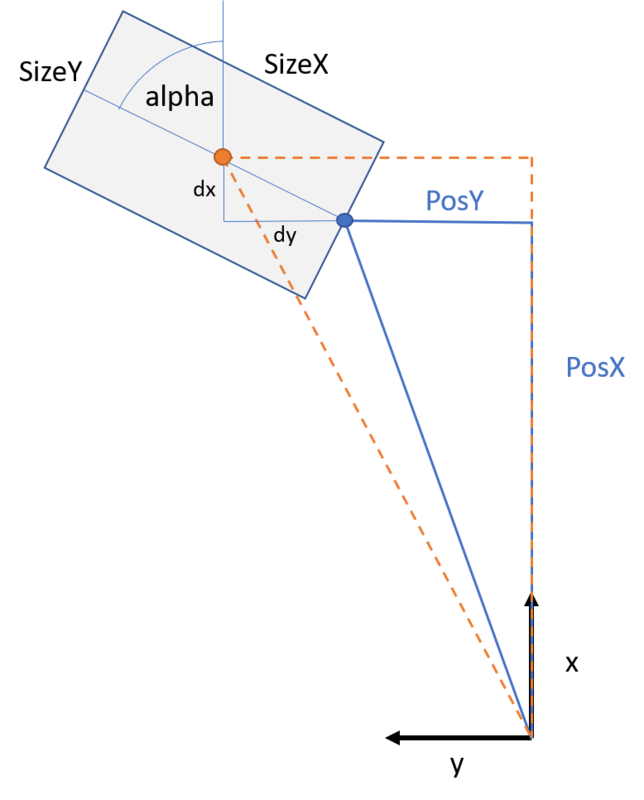 The bounding box is rotated around the main frame's x-,y-,z-axis. The coordinates x1,y1,z1 are referenced to the surface lowest center point. I want to know the x,y,z-coordinates if I reference to the middle of the bottom surface. Now i want to get the x,y,z coordinates in 3D of the second point. How is the general approach for something like this? autonomobil is a new contributor to this site. Take care in asking for clarification, commenting, and answering. Check out our Code of Conduct. The general approach is to use matrix manipulations of your points. It's the basic method by which all 3d stuff is translated. Your rotations, translations, and scales are put into a 4x4 matrix and then multiplied by each point to get the resulting position. The matrix multiplication will give you your resulting position, and then you do this for each point you want to apply the rotation to. Many transformations can been combined by mutliplying the transformation matricies together, then a point can have many transformations applied all at once. Read up on Matrix math for 3d transformations! autonomobil is a new contributor. Be nice, and check out our Code of Conduct. Not the answer you're looking for? Browse other questions tagged object math coordinates transform or ask your own question. Calculate new point offset based on angle of rotation? How to rotate point around another one?